Guide to Visiting Salinas Ecuador: How’s the Beach? Ecuador is for hiking and jungle exploring – right? Who goes to Ecuador for the beach? That’s what Mexico and Aruba and the D.R. is for, isn’t it? Check out this new video – and let us know what you think. This guide is a work in progress. We’ll be updating this in the coming weeks. Learn more about the other beaches in Ecuador. Recently we visited Salinas which is about 2 1/2 hrs west of Guayaquil on the Pacific Coast. It is a beautiful little town with an awesome beach. Check out the new video below. As a family, our favorite place on the coast (so far) is Salinas. Although it is technically a city, it really is just a town with a ton of vacation condos. It feels very safe and the beach is beautiful. There are polite food/souvenir vendors, the beach is clean and the water is warm. What else could you wish for? While we were vacationing in Salinas, a friend offered to take us to a local fish market. We love fresh fish, so we jumped at the opportunity. The market was very busy, full of people bustling all over carrying all different variety of fish. There were big ones, little ones, red and blue ones, some swordfish, and some huge tuna. Our daughter enjoyed seeing the fish but seeing the fish getting gutted and cleaned didn’t sit so well with her. There were wooden tables set up all over the beachfront, and they were cleaning the fish right there while people waited for what they had picked out. As we stepped on to the beach area where the market was taking place I realized I had made the wrong choice in footwear. My flip-flops quickly became full of wet sand, fish scales, and who knows what else. The scene proved to be a little overwhelming for our daughter, so we decided to wait on some steps while Bryan took care of the dirty stuff. As we stood there waiting, I had to do a little damage control. Our daughter was quite disturbed at seeing the cleaning process happening right there in front of her. So I explained that this was just part of normal life for the people working/buying at the market, and that they didn’t appear to be all that disturbed by it. As we talked she was able to rationalize the situation, and accepted the fact that this had to take place in order to process the fish. Although she didn’t enjoy seeing the messy stuff, it was a good experience for her. She absolutely loves eating fish, so that went a long way in smoothing the situation over in her mind. We did enjoy watching the pelicans and albatross swooping and circling around the market. There was one pelican in particular that sat on the roof of one of the buildings keeping a close eye on all the activity taking place below. We called him “King of the Market” and watched as he swooped down time and again trying to get a bite to eat. We tried two different kinds of fish, Albacore and Mahi Mahi, we got 5 pounds for $16. The fish was delicious, and our friend offered to shrink wrap some for us to take home. We just finished it off last week, next visit we’ll be going back for more. But this time I’ll wear my sneakers, and stick to the steps. Read more about fishing in Ecuador. I think it varies on time of year but generally it is. To answer your other question, you might want to check out Can I Bring my Pets to Ecuador? Hi Bryan, My name is Richard and I am planning a five week trip to Ecuador leaving in just ten days, August 7th. I am thinking of relocating to the coast, maybe Salinas or Manta. I think Cuenca would be great, but I have C O P D and probably couldn’t handle the altitude. I also can’t handle temps below 70*F and preferably not over mid to high eighties. I hate AC. I currently live in beautiful Puerto Rico, but it is just to expensive for a fixed budget. I may even look at Esmeraldas. What would be your recommendations of these cities for an 84 year old who looks more like late 50s or early 60s? My wife and I relocated here from the Washington D.C. area. Salinas happens to be the only place along the coast of Ecuador where the ocean current created the Humboldt effect. You can look up the Humboldt current on wikipedia. It keeps Salinas from getting really hot and humid like most of the Ecuadoran coast. For someone with COPD, I highly recommend this area. We just went through the cold season, and I don’t think the temperature every dropped 68 degrees, F., and even that was rare. No one here has heating, and although many have air conditioners, they rarely use them. Check this place out! We sure like it. 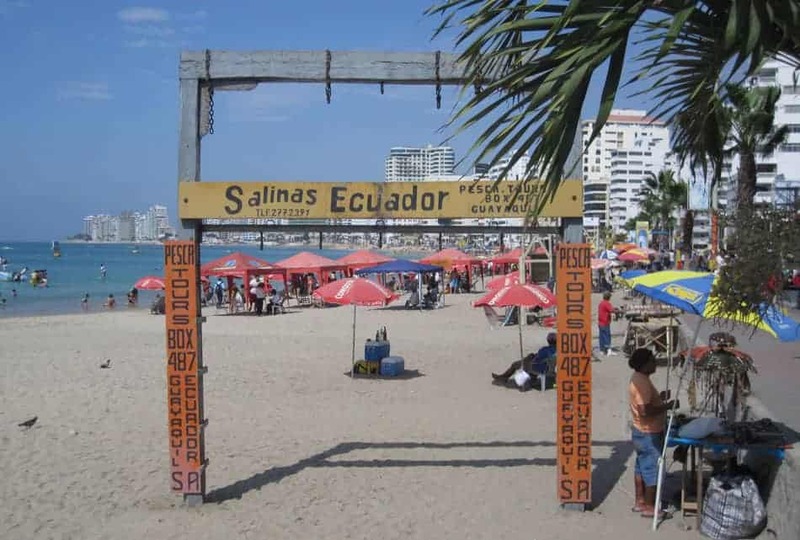 All… Personally, I believe that Salinas is one of the least interesting beaches along the Ecuadorian coast. I would not waste my time there. Salinas and Playas are popular local tourist destinations, because they are the closest beaches from Guayaquil, so they are the places where Guayaquilenos go to relax on the weekend. When having more time than a day or two I prefer the beaches in Manabi by a long shot. Depending on the coastal stretch climate and vegetation can go from semi-desert to lush tropical rainforest entering Esmeraldas. Around Olon humid semi-tropical forests break through to the coast which skews the climate a little bit towards more precipitation. It is a stretch of the coast that I like a lot, since I like trees and green. Towards Ayampe and Machalilla climate and vegetation become dry again before turning tropical humid before Esmeraldas. I believe this is also caused by water currents that break through to the coast. There is a cold current going up from Salinas and there is a warm current coming down from Esmeraldas. You can drive 6 hours north from Salinas to Esmeraldas and you will find the water 10 – 15 degrees warmer at the destination compared to where you started from. The ocean in Esmeraldas can almost feel like a hot tub at times. Jakob I really appreciate that info. on the different climate and veg. changes along the coast. That’s very helpful to us who haven’t had a chance to explore the coastal differences. Thanks so much! Hi Bryan, nice to know that there is somebody out there to help us. How good are urbanizations in Salinas? Is it worth to buy there? One more thing: where can we go for help on the residence visa issue? Do you know anyone realiable? hi my name is ruben and thinking of going to ecuador to retire with my wife but we would like to no about crime and related problems? My name is Linda and I'm writing to inquire about the coastal areas of Ecuador from a person that doesn't have any alterior motives in mind when presenting their thoughts on the country. I know that everyone's going to Cuenca as expats (it seems), but my husband and I (and my elderly father) are more "beachbums" during the week and shaman seekers on the weekends. We'd like to relocate by the end of 2011. I read somewhere that it is cloudy most of the year in Olon and sunny in Ballenita. What have you noticed or what do you know about this statement? They're not that far apart, but I've also read that there are a myriad of microclimates within the country. I just want to focus on the beach, beachfront properties specifically and sunny ones, for the most part. Any info you care to shed or links to sites that would help me in deciding will be greatly appreciated. Hi Linda, You're right, there are many microclimates – just a few kilometers can make a significant difference. I haven't been to Olon, so I cant comment. We visited Salinas / Ballenita for two weeks last October – and for 13 of the 14 days, it was cloudy and cold. But everyone commented that this as extremely unusual. The best thing I can say, is to come and stay a couple of weeks at each place. Its best to see them first hand before deciding. All the best on your plans. Previous: Are Panama Hats Made in Ecuador?